1inch=2.54cm, please allow 1-2cm measurement error. Lift your look and get peachy in this skirt! With its light rose hue, on trend lace up, two pockets to the front and a peached fabric, you’ll be looking dreamy! Team with a white bodysuit and lace up heels for a babin’ evening glow. 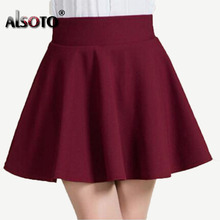 We adopt the very high quality fabric to produce the skirt, it is strechable in all direction, and thick for autumn, soft touch to skin. But please note, there is zipper sewed at back, the waist can be 1-2cm strechable, not strechable like a single fabric.